보협인탑이란 『보협인다라니경』을 그 안에 안치하고 있기 때문에 붙여진 이름이다. 종래에 볼 수 없던 특이한 모습인데, 중국 오월(吳越)이라는 나라에서 그 유래를 찾을 수 있다. 오월국의 마지막 왕인 충의왕 전홍숙(錢弘淑)은 인도의 아소카왕이 부처의 진신사리를 8만 4천기의 탑에 나누어 봉안하였다는 고사를 본따 금, 동, 철 등의 재료로 소탑 8만 4천기를 만들고 그 속에 일일이 『보협인다라니경』을 안치하였다. 이와 유사한 형태의 탑을 보협인탑이라고 하는데, 우리나라에서는 유일한 이 석조 보협인탑이 동국대학교 박물관에 보관되어 있다. 원래는 천안시 북면 대평리 탑골계곡의 절터에 무너져 있던 것을 이 곳으로 옮겨 세운 것이다. 절터에는 자연석으로 쌓은 축대와 주춧돌의 일부, 기와조각들이 남아 있어 고려시대의 절터로 추정되나, 이 곳에 대한 기록은 전하지 않는다. 복원된 탑의 현재 모습은 5개의 돌만 남아 있어 완전한 형태는 아니다. 우리나라 석탑의 일반형식과는 전혀 달라서 기단(基壇)과 탑신(塔身)의 구분이 뚜렷하지 않고 완전한 형태를 짐작하기도 어렵다. 뚜껑을 덮은 듯한 네모난 상자 모양의 돌 2개를 포개어 놓은 후, 그 위로 귀를 세운 머리장식을 얹어놓은 모습이다. 불상(佛像)이 새겨진 육면체 위에 4각형의 받침돌을 놓고, 다시 그 위에 육면체가 놓이는데 4면에 부처님의 전생설화가 새겨있다. 이 탑몸돌 윗면 중앙에는 『보협인다라니경』을 안치했던 것으로 보이는 둥근 사리구멍이 남아있다. 당나귀 귀처럼 솟은 맨 윗돌에는 그 안에 석가의 일대기가 상하로 나뉘어 새겨져 있다. 전면에 조각이 가득한 이 탑은 중국 보협인탑의 영향을 받은 듯 하고 외형도 거의 비슷하다. 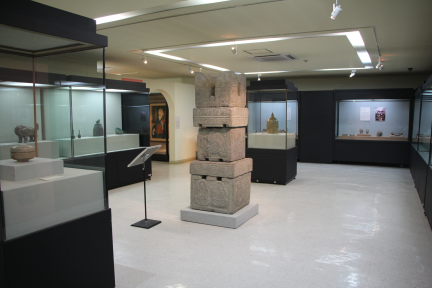 고려시대에 건립된 것으로 보여지며, 우리나라에 하나밖에 없는 보협인석탑으로서 매우 귀중한 가치를 지니고 있다. 이 탑은 2018년에 실시된 인문학적 조사와 3D촬영 등 과학적 조사 결과(국고보조사업)를 바탕으로 기단면석(제1석), 기단갑석(제2석), 옥개석 받침석(제4석) 등 일부 부재가 구조적으로 가장 안전한 방향으로 배치되었다. 또한 기존에 부재 간 고임재로 사용되었던 동전을 티타늄판으로 교체하여 안정성을 높였으며, 하단에는 받침석을 새로 제작‧설치하였다. 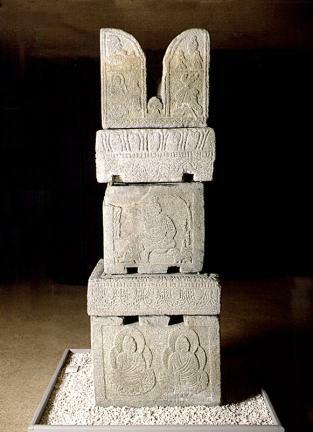 This stupa is called Bohyeobin Stupa (the Stupa of Treasure-casket Seal) because it enshrines Bohyeobin Dharani Sutra (the Sutra of Treasure-casket Seal Incantation). 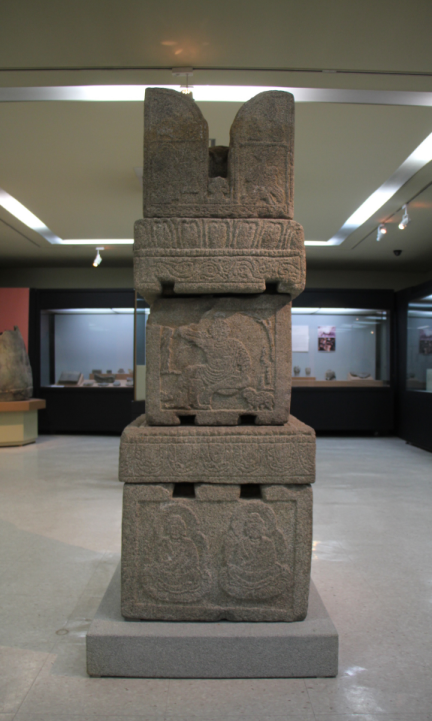 This kind of stupa dates back to the Chinese Wu and Yueh period. 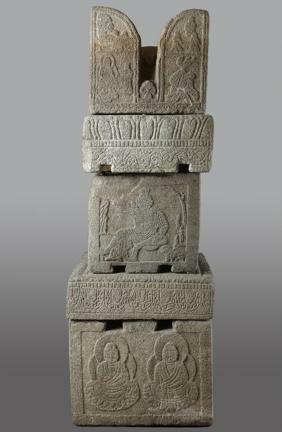 Quian Hongshu, the last king of Wu and Yueh, first built 84,000 miniature stupas made of gold, silver or iron and enshrined the sutra in all of them, imitating the anecdote of King Asoka of the Indian Mauryan Dynasty who is said to have divided Sakyamuni's true body sarira into 84,000 portions and enshrined them in as many pagodas. 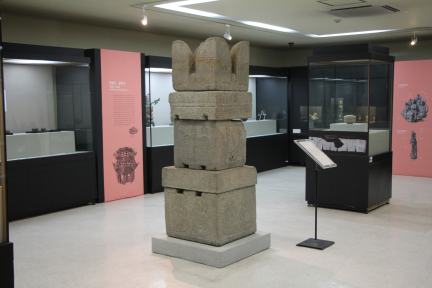 This stone stupa, the only extant one of its kind in Korea, is on display at the Dongguk University Museum. 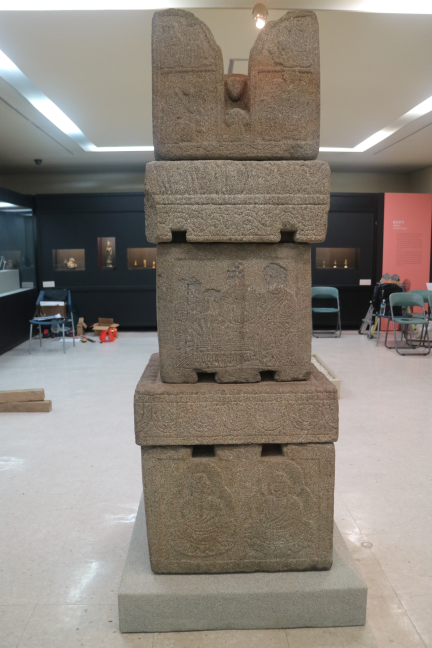 The stupa was found on the site of an old temple in Daepyeong-ri, Buk-myeon, Cheonan City. As there is no record left about the temple, even the name of the temple is unavailable. 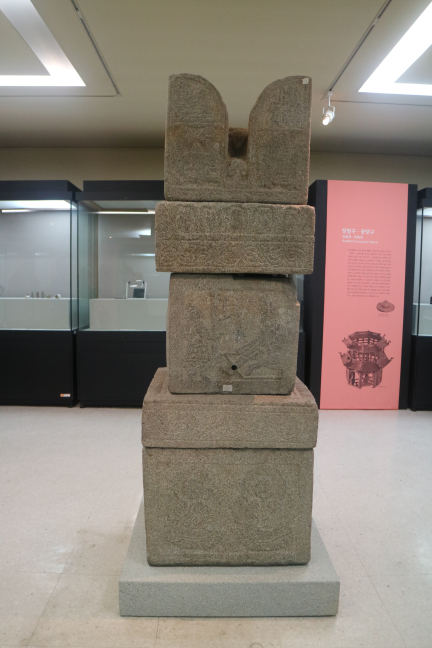 Judging from the remaining portion of stone terrace and foundation stones and fragments of roof tiles, the temple is believed to date to the Goryeo period. 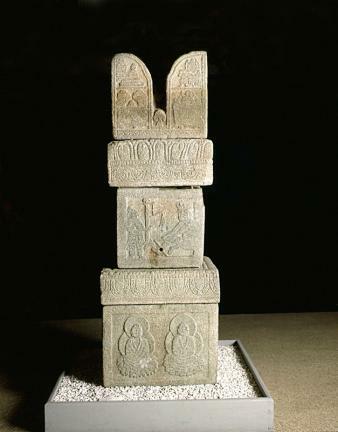 As much of the stupa has long disappeared, it was only partially restored with five remaining stone parts. 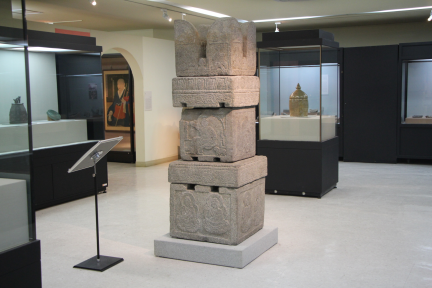 Unlike typical Korean-style pagodas or stupas, the stupa has no clear distinction between the foundation and the main body. 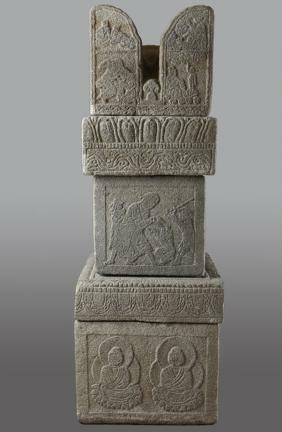 It looks as if two lidded caskets are piled up one upon another, with donkey ear-shaped ornament installed on the upper casket. 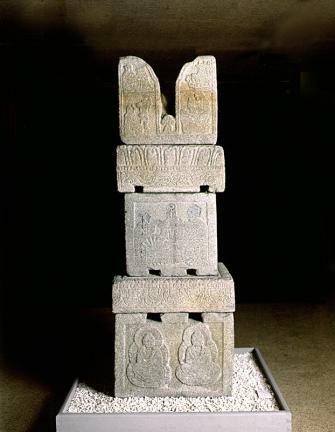 A square base stone is installed on a hexahedron which is decorated with a design of Buddha's pedestal. 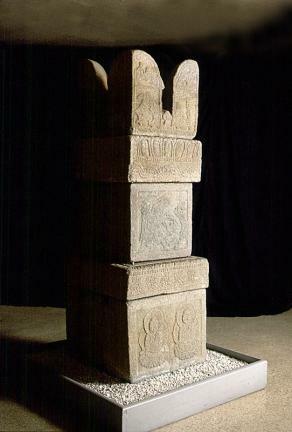 On the top of the base is laid another hexahedron which deems to be the main body of the stupa. 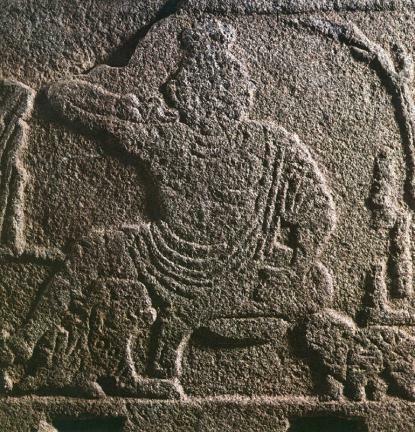 On all sides of the body-like portion are carved tales of Buddha's former life. There is a hole (7cm in diameter and 6cm in depth) in the center of the upper portion of the body. 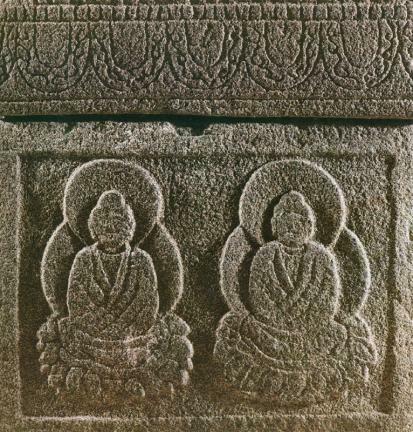 The hole is presumed to have enshrined the sutra. 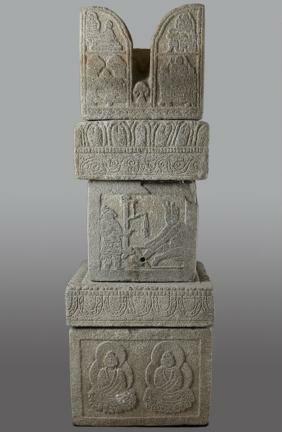 The donkey ear-like top portion has an inscription telling of Sakyamuni's life in two stages. 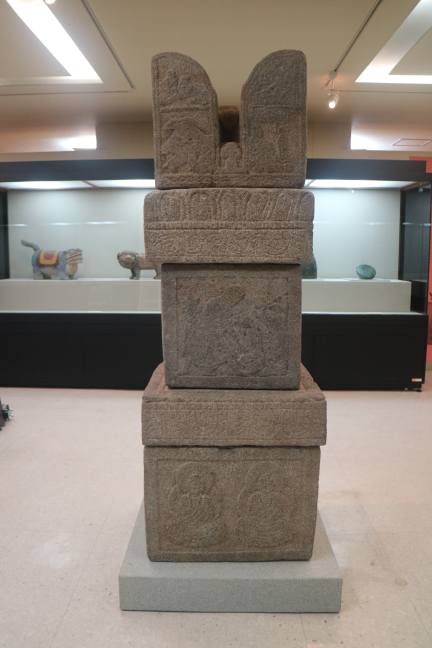 This stupa which has a variety of sculptures on all sides seems to have been influenced by that of China. 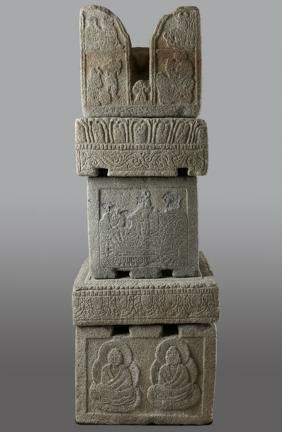 With its uniqueness and peculiar shape, this stupa is of great value for the study of Buddhist stonework.